Freedom of speech today is one of the frequent arenas of clashes in the Muslim world. How should one respond to an offense against religion? Who gets to decide what is an offense? Mired in all this is a changing definition of religion - from public to personal. The impact of these issues is, of course, even more for Muslims living as religious minorities in the West - and a checkered history of threats against Salman Rushdie to the Danish cartoon fiasco. 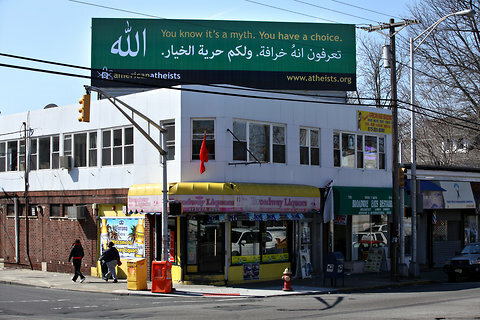 While the billboards have been criticized by the Hasidic Jewish community, some Muslims, including members of The Islamic Center of Passaic County, which is two blocks from the billboard location in Paterson, have reacted with equanimity. The executive director of the center, Mohamed Elfilali, said he had heard no complaints from the Muslim community. He said that the $15,000 spent on the billboards might be better diverted to charity, but added that the Center planned to invite Mr. Silverman to a forum. The problem is, the atheist organization has put up a slogan which is correct in a sense. Allah, or God, is a 'myth' so does the religion starts with the notion of 'faith' which essentially means that its existence can never be objectively proven my physical means. So you have to believe if you are to follow the religion. Otherwise there is "...no compulsion in religion" (Quran 02:256). It is beyond human intellect. Just like what was 'before' the big bang is beyond science...science as we know and define it, and so the physics sticks only to whatever is after the big bang. Now whether God is real or is it a figment of imagination, it is the product of human inference that this intricate universe is possibly a product of a thought behind it. So there should be no offence to both groups, both can have useful feedback from each other's ideas about the creation. And no, Islam does not stops you from scientific inquiry. There are more verses in Quran about inquiring into nature and universe than salah (prayer). This is a common misconception among atheists that a belief in God stops you from scientific inquiry. As an Agnostic Atheist (former Muslim), I support this movement by the American Atheists! Atheists don't think anyone is going to hell, unlike the religious people who think people outside of their faith are going to burn in hell for eternity. Muslims hardly ever (if at all) speak evil of the holy figures of other religions like Jesus, Mary, Buddha, Moses, etc. Yet it is the favorite pastime of atheists and non-muslims to do so in relation to Islam. 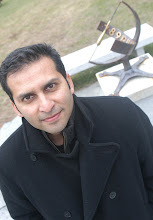 It is a common excuse for many polemics to portray as former Muslims (or former practicing muslims) to support their views. But a little scrutiny reveals otherwise. As opposed to the notion brought forth by 'AnotherAnonymous' in the preceding comment, Quran proposes a penalty not only for non-believers but also the same for Muslims who do bad deeds. This is one of the basic teachings of religions if one is at all aware of anything about Islam. Secondly, it is mentioned in the second chapter that those who are belong to other faiths who did good deeds and believed in one true God and believed in the Day of Judgement and hereafter will get their full reward in afterlife. There are dozens of verses in Quran pertaining to the hell for non-believers, most of which were for those at the time of the Prophet who were also involved in gruesome acts of torture for the Prophet and his kins. I've read the verses in the Quran and knew what you mentioned above already. When you mention "other faiths", Quran is only referring to Abrahamic faiths. This means the God of Islam aka Allah will put those of non-abrahamic faiths,atheists, and agnostics in hell for eternity. Do you think it's right for Allah to put anyone in hell and have them burn for eternity? I don't, and that's a major reason why I choose to be an agnostic atheist. It's not right to burn and torture someone for eternity, that's very cruel, evil, and sadistic. The discussion of evil or hell or name-calling members of another group (atheist or theist) is not going to go anywhere. You can always find such examples on all sides. The central issue here is that of freedom of speech. We may disagree on things - but still respect the right of others to speak. This is difficult - and perhaps we should appreciate the effort that goes into it. A very balanced and straightforward response from the Islamic Center. This is the way it should be. It is sad when the debate comes down to an exchange of insults from both sides. Much better to take the approach of E.O. Wilson in his book "Creation". He recognises that there are problems in the world which transcend the issue of God vs Atheism and calls for a civilised dialogue and action from both sides. Blasphemy issue - in Russia? Film Autopsy of the movie "Pina"
So how cold was it for Al-Mamun? So you still want to take Harun Yahya seriously?